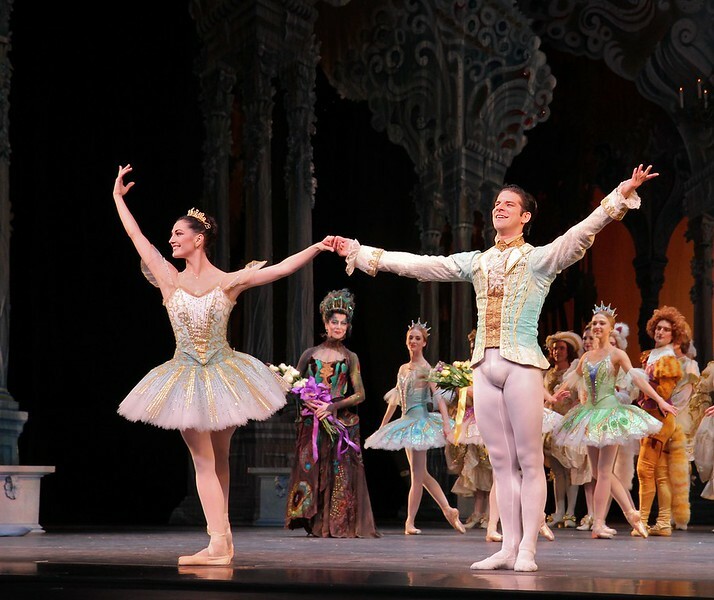 Veronika Part was spectacular as Aurora in ABT’s final Met performance of 2013 of Sleeping Beauty. From the moment she appeared on the balcony and descended the stairs to join her 16th birthday party, Veronika took command of the stage with energy, confidence, and style with precise technique and grace, taking full advantage of her long, pure, elegant line and nice turnout and extension. I have not seen Aurora performed this well in a long time. Veronika performed the difficult Rosa Adagio nicely with great control and confidence. Some dancers perform this adagio well but with a nervous look of an impending root canal; from my vantage point she did not display any anxiety before or during the adagio. During her balances, she raised her arms to fifth en haut (arms above her head) with a pause before placing her hand down to her next prince. Some dancers do not raise their arms to fifth position, but quickly and anxiously grab the hand of the next partner in desperation. Not Veronika as there were no rough edges Saturday evening. After the adagio in the forest scene, she performed a nice solo with ronde de jambe to a jete diagonal that was uniquely done. Also notable during the pas de deux solo was the way she moved her hands in sync to the beautiful music. Marcelo Gomes perfectly complemented Veronika as Prince Desire. He also has a nice long line and great extension. He is a perfect prince as he showered attention to his new love, beaming in admiration. He partnered her effortlessly throughout and his solos were also graceful with nice deep plies ending in a tight fifth position on his tours and jumps. He makes dancing look very easy, a sign of a great dancer. Stella Abrera was also very good as the Lilac Fairy. She was particularly convincing in Act II when she convinces Prince Desire to stay in the mysterious forest by granting him a vision of Aurora’s beauty. With the Lilac Fairy’s help, the prince defeats the evil Carabosse (Martine Van Hamel) and awakens Aurora with a kiss and the spell is broken. The three dancers do a remarkable job describing the story with expressive gestures and mime. I was happy to see Misty Copeland as Princess Florine in the Bluebird pas de deux with Blaine Hoven, I haven’t seen Misty dance much this year; she was light, energetic, and airy as a bird. Blaine did a fine brise vole beat diagonal that epitomizes the Bluebird solo, capped off by double tours with arms in fifth en haut (arms raised above his head).